Learn about the Fiddle Leaf Fig Tree. A low maintenance beauty that makes a statement in the home reaching a height of up to 10 feet. Have you noticed this beautiful tropical houseplant that is tall and skinny with really large leaves? The fiddle leaf fig tree or Ficus Lyrata is becoming very popular in home decorating, and as I continue to set up my home office, I felt it really needed such dramatic beauty. I’ve been keeping an eye out for one at Home Depot and my local nurseries, but after a while, I decided to just order one from Amazon – Fiddleleaf Fig Tree . I was so surprised, and excited, to find it with my mail, just 3 days later. Packed well with peanuts and masking tape over the dirt, it looked un-phased from the trip. The first thing I did after removing the masking tape, was to set it in the bathtub and give it a good drink of water. This plant, like so many others, likes to be watered thoroughly until you see water draining out the bottom. Never let it sit in water. So while it was draining I took a damp cloth and wiped down the leaves. The newer ones on top really didn’t need much, but some of the older leaves were pretty dusty. For now, I have it on a side table next to a bright window in my office which faces southwest. Soon, all the leaves from the maple tree outside the window will be gone, allowing even more light to shine in the room. It is a South-East facing window so there should be plenty of light for this plant. I’ll wait until the pot is thoroughly dried out before watering again. Also if I stick a finger in up to my second knuckle and the soil feels dry, then it’s time to water. Update: I ended up with a routine of a thorough watering every other week. While I can still lift it I will probably take it back to the tub. If it gets too big to lift I’ll have to be more careful, using a drainage saucer and double checking that no water is left for the pot to sit in. Height: This tree can reach up to 10 feet indoors. Don’t worry they are pretty slow growing but it’s something to think about. Sun: Bright Indirect Sun, some say a west-facing exposure is best. Like any houseplant watch out for drafty areas or extra cold windows. Water: Let it dry out, then water well, until it comes out the bottom. Do not let it sit in water. I like to take mine to the bathroom, water well and then let it sit and drain a bit before moving it back to its normal spot. Fertilize: I use a higher nitrogen fertilizer like Miracid about once a month or every other month. Pot: You should re-pot once a year in the spring while the plant is young using a soil that drains well. Like many houseplants, Fiddle Leaf Fig trees like to be a little pot bound so choose a pot that is only 1-2 inches wider than the root ball. 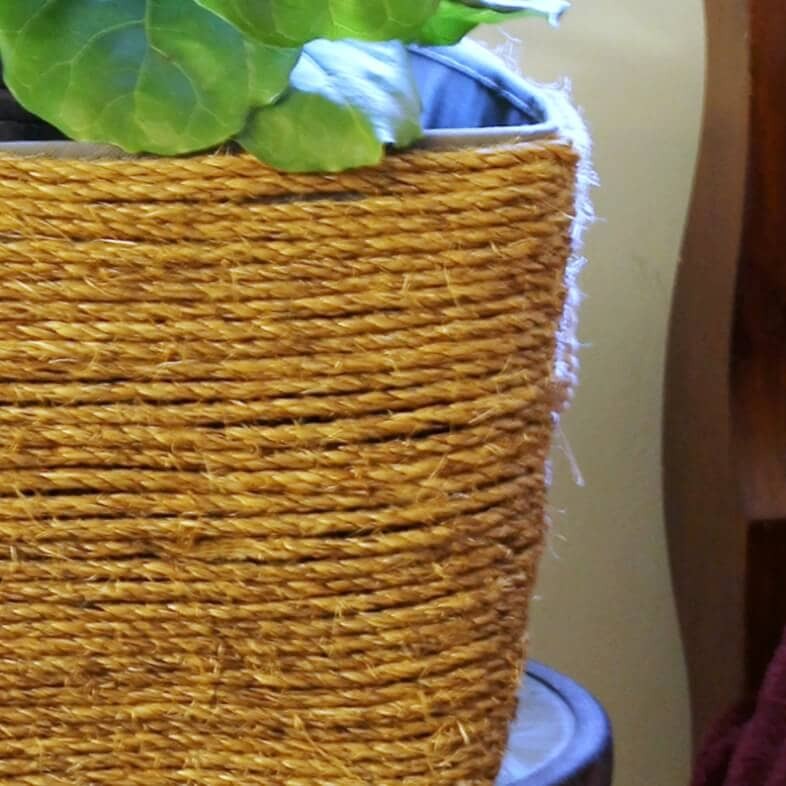 I placed the fiddle leaf fig in a decorative rope basket I made with a place saucer in the bottom to protect the basket and catch and extra water. This way I won’t have to disturb the plant until it’s time to re-pot. This video was great too. If you keep an eye out you will find these in the local big box stores. They are usually pretty some but that’s a great place to start. And if you can’t wait you can always buy them online. I love the way Fiddle Leaf Figs make a statement in the home. It’s a keeper. My fiddle leaf fig is now over ten feet tall and lovely. I am going to prune it next spring as long as it can wait that long. I plan to root the cuttings. I believe the secret to house plants is this. Set the pot with drainage holes on pot feet inside of a large saucer. This way the plant can get thoroughly watered but never sit in water. This may not look very appealing but since I have started all my houseplants this way I never have had sad plants and never had to worry about wet and ruined hardwood or carpet. That’s wonderful Judy. Overwatering and not having good drainage is so important. Thanks for sharing your experience. Oooh, I want one!! Off to Amazon I go! I got a large fiddle leaf fig early this spring! I love it and it did very well until very recently. I had been giving it a small drink every Friday, because that is what some websites said they liked. However, in the past few weeks, it has started to drop leaves and some of the leaf edges are turning brown! I’m in a panic. I wonder if I should give it a good thorough water like you said and see if that helps. I don’t want to loose my fig!!!! I’m so sorry you are having problems with your fig. Since this is my first fiddle leaf fig I can only guess at what might be the problem. Everything I have read says that they hate to be over watered but a small drink once a week hardly seems like too much. However, is there enough drainage? Even a small amount left for the pot to sit in may cause a problem. I’ve also read that you should wait until the top leaves start to wilt before watering again. How does the top look? Is it still producing new growth? I do think it is normal for a few of the bottom leaves to shed. Look under the leaves for any pest issues too. Perhaps a little diluted fertilizer would give it a boost. Has anything else changed? Is the light different due to the time of year? Too much direct sunlight can also be an issue? I hope this is only temporary and that your fig perks up soon. I live in Florida and I have kept my plant out side in full sun since I bought it a year ago and it is beautiful. I would like to transition it indoors. How can I do that without damaging it. Thanks. This is my first tree so I am no expert. All I can tell you is that if its happy outside it may take a while for it to get used to new growing conditions. Florida is somewhat tropical and that is the natural habitat for this tree. If you bring it inside, to say an air conditioned home, it may be a shock. If it’s not to big, try move around try moving it inside for a few hours every day then back outside. If that is not feasible, just find the best indirect sunny spot, away from any drafts and keep an eye on it. Even if it loses a few leaves in the transition phase, it may very well bounce right back. Hope that helps.